KELLOGG PARK — Pacific Coast Land Design, Inc.
Plans to develop Kellogg Park as a neighborhood park for the Westside of Ventura community began in 2013, as a dream for a vacant lot along Ventura Avenue (affectionately called “The Ave”). The City of Ventura was able to move this dream forward in partnering with the Trust for Public Land to purchase the 2.4-acre property, beginning an active partnership with members of the community to develop a comprehensive conceptual plan that met the varied demands for the park. In 2015 PCLD was chosen to move the design of the park from concept through construction documents, present ideas to the community, and eventually see the park through construction. The park opened to great fanfare in April of 2018. 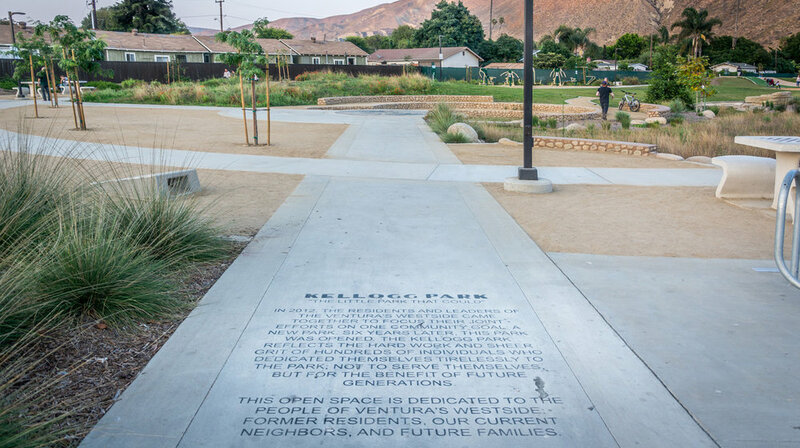 The design of the park is primarily structured around a ¼-mile looped walking trail and a natural “river” stormwater swale that blends infrastructure as an aesthetic and use amenity, referencing the geology, hydrology and biology of the nearby Ventura River. Ventura Avenue, the west-side community’s primary artery, forms the western boundary of the park, which features a multi-generational community gathering area with beanbag toss games, game tables, and a small amphitheater with varied seating that also serves as the terminus of the park’s stormwater infrastructure. The stage of the amphitheater doubles as a public art piece, integrating one of the park’s several pebble mosaic pieces by local artist Kevin Carman. Other park features include exercise equipment and a large playground. The playground is divides 2-5-year-old and 5-12- year-old play areas with a ridge feature that also offers climbing features and access to several raised playground features, including a “Jack-and-Jill” artificial-turf slide hill. Along the site’s northern boundary, the residential lots are divided by small community garden. The natural character of the park is reflected in its primary sustainability feature; a sand-filter swale that reflects the natural character of the nearby Ventura River. This feature is designed to detain and infiltrate runoff from large storm events by containing both on-site water and also by pulling in runoff from neighboring Cameron Street in attempt to alleviate local flooding problems and mitigate runoff quality. In addition to the stormwater benefits of the swale, which only occur during California’s seasonally rare rains, the swale also serves as a use amenity with learning and play facilities scattered along is course. The feature terminates in the center of a “stormwater amphitheater,” using a variety of native plantings as the centerpiece to a community amenity. In addition to the swale feature, native plantings, minimal turf, and water-efficient irrigation will minimize the water demand in the park.